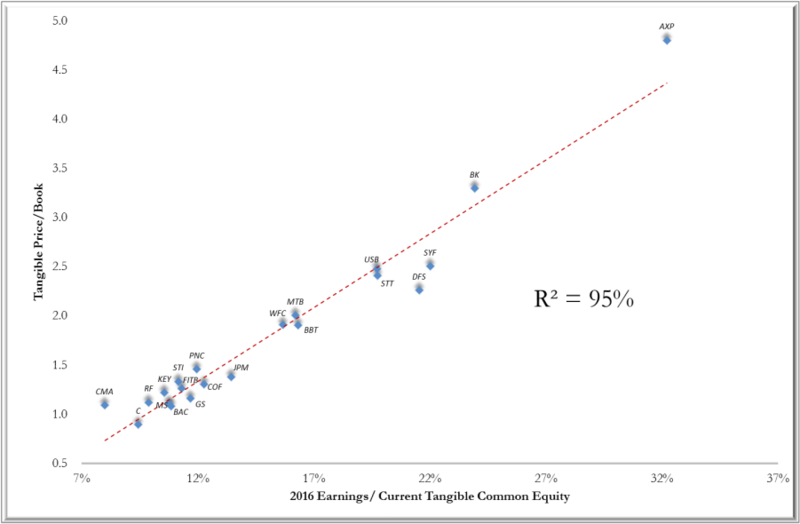 The card services segment at ADS, representing over 90% of operating profit in H12015, generates a (tangible) return on equity of 35% which is similar to that of AXP and, based on the standard valuation-regression for banks (providing a remarkable fit over a wide profitability range – see Chart), is worth at most 5x tangible book value of $1.8bn for a market capitalization of $9bn. Given the market cap of ADS is over $18bn, a sum-of-parts approach in effect ascribes an equity valuation of >$9bn to the non-card businesses which, in the nine months through September 2015, generated (adjusted) EBITDA of ~$550mm growing mid-to-high single-digits in constant-currency. Taking account of net debt of $4bn (excluding $5bn in card securitization funding), this is equivalent to an (annualized) EV/EBITDA multiple of >17x for these non-card businesses. ADS management prefers to present its card business not as a bank but as a loyalty company. Quarterly reporting focuses on performance measures appropriate to the technology sector, such as adjusted EBITDA (before interest expense but after card-funding costs), rather than those appropriate to a lending business such as net interest margin. There is no consolidated disclosure of yields and rates, or of the FICO distribution of customers. Fortunately, yield and rates data are available through the call reports filed with the FDIC by ADS bank subsidiaries, Comenity Bank and Comenity Capital Bank. 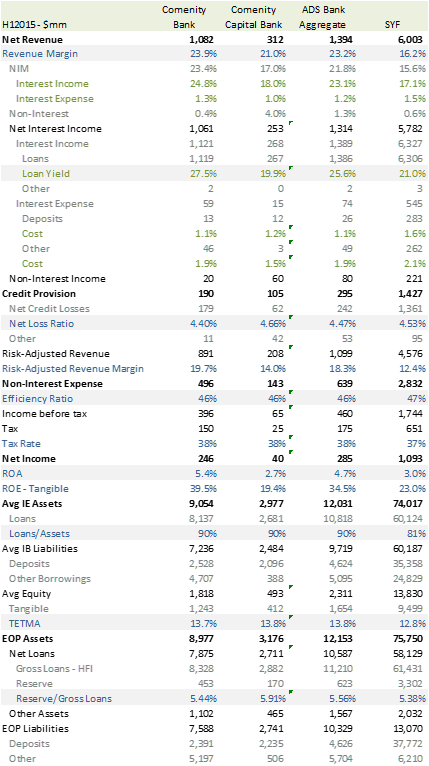 For this combined “ADS Bank”, the revenue margin is 7 percentage points higher than at SYF (largely due to a 4 point higher yield on card loans with the balance a combination of asset-mix, non-interest income, and funding cost) with 4 points given back in the form of proportionately higher credit and non-interest expenses. 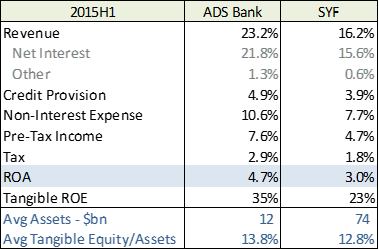 Despite slightly lower leverage, the difference in ROA gives rise to a tangible ROE at ADS Bank of 35% vs. 23% at SYF (see Table). Source: Company SEC Filings, Call Reports for Comenity Bank and Comenity Capital Bank, SSR Analysis. For comparability, retailer share of net interest income for SYF included in non-interest expense and not as a contra-revenue item as SYF reports. The difference in credit expenses is an artefact of earning-asset mix. The net loss ratios at the two companies (so net credit losses over loans rather than earning assets) was the same at 4.5% suggesting that the FICO composition of the portfolios is similar and that the ADS portfolio, rather than being “prime” as management has indicated, includes a meaningful proportion of loans to customers with FICO scores of 660 or less (the industry-standard definition for sub-prime). SYF has disclosed this proportion at 27.5% and it would be surprising if that at ADS were lower given the average FICO at SYF is 715 versus 700 at ADS. We note that, post-crisis, both companies claim not to originate sub-prime credits but that does not mean the portfolio remains prime because of legacy balances and because of FICO drift for some customers over time. The difference in non-interest expense arises because ADS has a lower average balance/active account (~$300 versus ~$900 at SYF) and servicing costs, such as sending out statements, scale with accounts rather loans. Low account balances, and the consequent high expense burden, are a key reason that private-label card lenders in general, and ADS in particular, charge high interest rates. Absent offsetting factors (such as loyalty offers) this can lead to adverse selection since only customers who cannot borrow elsewhere at lower cost take up private-label offers. Credit performance suggests that loyalty programs at ADS have neutralized this tendency to adverse selection validating management’s emphasis on their importance to the card business model. The advantage of ADS’s data-enabled loyalty marketing shows up in another way. While the expense-to-loan ratio is higher than at SYF, expense-per-active-account is lower ($64 by our estimates versus $115 at SYF). The expense-estimates include retailer share of net interest income and our thesis is that, because it serves smaller retailer-brands and provides advantaged marketing support, ADS is able to negotiate better splits than SYF with its larger retail brands. We expect the expense-per-account gap to narrow as ADS moves up-market (to Virgin Air and Meijer, for example) and as SYF, newly independent from GE, takes advantage of its scaled platform serving large retailers (e.g. WMT, AMZN, and PYPL) to compete for smaller retailers while also building data-enabled marketing capabilities. For now, however, the difference in expense/account is a driver of the relative profitability, and hence valuation, of the businesses. The natural pushback to valuing ADS in the conventional bank-framework is that it is growing much faster than the typical bank and, indeed, than SYF for which that is also true. For example, in 2014, SYF grew card purchase volume 10% of which 7% was organic versus 30%+ at ADS of which ~10% was organic; total growth at ADS is driven by portfolio purchases as retailers are intrigued by the ADS promise of card-data enabled solutions as an alternative to generic brand advertising for some or all of their marketing budget. We agree that the shift to direct marketing is transformational and that ADS has benefited as an early mover in combining the personally-identifying information available to the owner of a card-payment account with item-level data provided by the retailer. However, we expect scale-players to be fast-followers including SYF (particularly given its relationship, through WMT, with the retailer payments consortium MCX and the CurrentC-branded mobile wallet), AXP (given the launch of Plenti which is similar to the ADS Epsilon business), and JPM (through ChaseNet). In particular, we expect the business models of SYF and ADS to converge and, given valuation and credit culture, prefer SYF over ADS. With over 90% of operating income generated from card-lending ($561mm in H12015 of consolidated total of $610mm), ADS is a bank reporting as a technology company. It is striking that company filings do not include the standard information on yields and rates presented by consumer lenders and unusual that ADS instead highlights EBITDA for card services; this “before interest” measure is, in fact, adjusted to be net of the cost of funding card loans through securitization. Fortunately, we can assemble a more standard presentation from call reports filed by the two bank subsidiaries through which the card-lending business is conducted: Comenity Bank and Comenity Capital Bank. Exhibit 1 presents that H12015 results alongside those for SYF which reports in a more standard format. Before commenting on the comparison we note that, where there is overlap, the aggregated bank results align well with those reported for ADS’ card services segment: the revenue and pre-tax income is $30mm lower and provision expense $5mm higher (presumably offset by non-interest expense being lower by a similar amount). Credit losses are an exact match and the loan amounts reconcile to within half-a-percent. 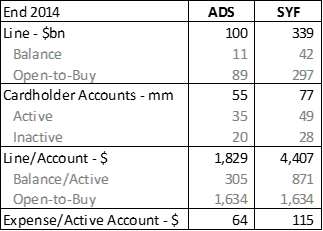 The other methodological note is that we treat the retailer share of net interest income not as a contra-revenue items as reported by SYF ($1,281mm in the period) but as a non-interest expense. It appears this is the approach adopted by ADS given the resulting similarity in efficiency ratios which would otherwise be quite different. A notable feature of the comparison is that SYF generates a revenue margin which is fully 7 percentage points lower than that of ADS (16.2% versus 23.2%). Differences in funding costs of 0.3% (1.2% versus 1.5%) and non-interest income of 0.7% (1.3% versus 0.6%) explain 1 percentage point, leaving 6 percentage points related to earning asset yields. Of this, 2 percentage points arises from differences in asset mix on two dimensions: first, ~$2.5bn or 4% of SYF loans are non-card and carry a lower yield of 10% which is about half that on card (whereas all loans at ADS are card); and, second, 20% of earning assets at SYF (double the proportion at the ADS banks) are non-loan carrying a blended cash-and-securities yield of less than 1%. While these small variances add-up, the relative results are dominated by a 4% difference in the yield on card loans: 21.6% at SYF (not show in exhibit) versus 25.6% at ADS. This difference is directionally consistent with lower average account balances at ADS (~$300 for active accounts versus ~$900 at SYF – Exhibit 2); given that servicing costs, such as sending statements and collections, do not scale with loan balance lenders with low average account balances tend to charge higher interest rates. More broadly, this explains why private-label credit cards charge higher interest rates than Visa-branded cards which, having “general-purpose” utility beyond a particular retail brand, tend to carry higher average balances. The typical consequence is that low-balance cards are adversely selected in the sense that customers who could get a lower rate elsewhere tend to do so leaving actual customers as those without alternative lower-rate options. The data do not suggest either of these typical dynamics operate at ADS. The firm is not giving back its higher card interest rates in higher non-interest expense which, at an estimated $65/active account appears about one-half that at SYF, nor in higher credit expenses given both firms run a loss ratio of ~4.5% and ratio of allowance (for loan losses) to gross loans about 100bps greater at 5.5%. A likely explanation for the former is that ADS tends to deal with smaller retailer brands (so, for example, Orbitz and Victoria Secret versus WMT and AMZN at SYF) and is able to negotiate a lower retailer share of net interest income (which we present in non-interest expense rather than a contra-revenue item as reported by SYF). This benefit will likely weaken as, to sustain growth, ADS works with larger clients (such as Meijer and Virgin Air) while SYF deploys the scale advantage from its large-retailer platform to move down-market and service smaller retail brands. Analyzing credit performance is complicated by the lack of disclosure at ADS. It is standard practice among card-lenders to provide a broad distribution of loans and/or account by FICO score. Both SYF and ADS assert that, since the financial crisis, new originations are of prime quality with SYF CFO Brian Doubles remarking that “all of the accounts we are underwriting are prime credits above 660 FICO” and ADS CEO Ed Heffernan putting it more bluntly that “we do not target sub-prime borrowers” and noting that approval rates have fallen to 30% or below from a pre-crisis 60% or above. However, ADS goes further to say that “we have a prime portfolio” and this is unlikely, in the industry-standard sense that of no meaningful balances to customers with FICO scores of 660 or less, first because of older vintages and second because the FICO scores of some accounts will deteriorate over the life of a loan balance. Indeed, SYF discloses that just over one-quarter (27.5%) of its card balances are to customers with FICO scores of 660 or less and it is unlikely that ADS, given its similar credit metrics, has a meaningfully different portfolio composition. Indeed, Ed Heffernan has indicated the average FICO score at ADS is 700 and this is lower than the 715 for active accounts disclosed by SYF.